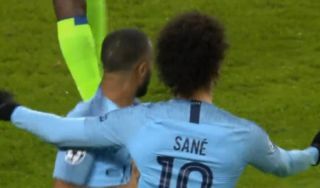 Raheem Sterling has scored a fine team goal for Manchester City from a lovely cross by Leroy Sane. The England international’s goal makes it 4-0 against Schalke on the night in this Champions League clash, and 7-2 on aggregate now in what is becoming a very one-sided contest. City were close to a surprise defeat in the first leg which would surely have changed the flow of tonight’s game. Still, City fought back late on that day and are now strolling to a comfortable win to make it into the Champions League quarter-finals.